The GHR’s vision of success is that marginalised women and men will be able to claim their rights from duty bearers, that duty bearer will respond and that they will implement pro-poor and socially just laws, policies and practices. 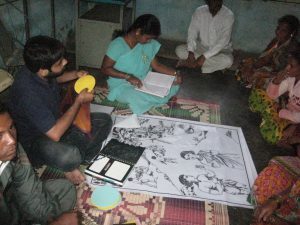 Trócaire needed to determine the level of awareness of the target groups – rural marginalised households in south Orissa focusing on dalits and tribals in general, and women from both groups in particular – with regard to their rights (Women’s/MGNREGA/PESA), access to these rights and action taken on violation of rights. Since the programme is implemented through seven NGO partners (BKS, SEARCH, HARMONY, Jana Vikas, SFDC, CWS, and NAWO), Trócaire also wanted to know the value it added to the partners and partners capacity on Governance and Human Rights. Sampling: A multi-stage simple random sampling method to cover Ethnicity and access parameters. 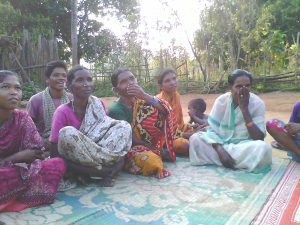 Atleast 10% of the project villages were covered to carry out the participatory exercises with women only groups and mixed groups separately. The participant’s responses were captured in a reporting format prepared by the researchers. Key findings from the analysis were presented in tables and charts. 2. CBO capacity Tool to assess the CBO capacity index of the CBOs as agents of change derived from their performance on three dimensions—Gender and inclusiveness, Influence, and Management capacities. Scores were assigned by the partners, and an index was created for each partner on the reported scores on the three dimensions. An aggregate CBO capability index encompassing all the partners was also created. The results of the CBO capacity tool were presented for each partner as a triangular radar chart with each vertex representing one dimension. 3. 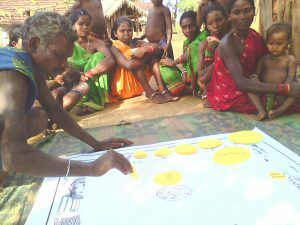 Partner Capacity Tool identify the level of influence of the partners (base level, contributor level, Mobiliser level, Leader, Authority) through their overall impact score derived from three dimensions— Influence with government, Supporting citizen action, Gender equality. The tool was used in two stages. In the first stage, partners did a self-assessment and reflected on the positioning of their organization with respect to the different levels. In the second stage, Trócaire had an in-depth and semi-structured interaction with partners and placed partners on five levels of performance under each dimension.